Transforming Business Operations: Our name is our mission. Real change -- if it is truly real -- is transformational. Real change impacts all the working parts of an organization: processes, technologies, the roles people play, how people work and how they see themselves within the context of the business. Achieving meaningful, desired change requires a disciplined approach, along with highly skilled, experienced resources. 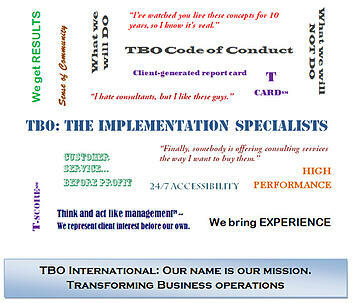 TBO delivers these capabilities and helps clients bring about positive change with sustainable bottom-line results. A clear, concise Code of Conduct representing foundational principles from which we do not deviate...ever.